When the Sonoma and Napa fires of 2017 tore through the Bay Area design community, several thousand structures were destroyed, and as many as 15,000 people were left without homes. Architects whose families and clients lost homes made it to the Monterey Design Conference last October to find comfort and to connect. Every year, I buttonhole attendees to seek out their favorite presenters. Sou Fujimoto won my informal poll, so I’ll start with him. Fujimoto began his presentation with a photo of a tree and a Tokyo city scene. The title of his lecture, “Between Nature and Architecture,” turned out to be the unintended theme for the conference. In all his work, Fujimoto questions obvious assumptions. This was true with two relatively small houses, House N and House NA, where he redefined the interior/exterior boundary. As with Richard Meier, most of his work is white. But unlike Meier’s work, his strives to almost disappear. He even questions assumptions about how to design a public bathroom in Ichihara, making the structure completely transparent and the landscape wholly private. 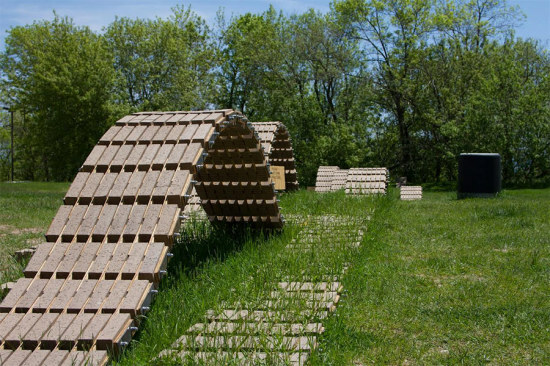 Weiss/Manfredi’s opening lecture addressed the “binary reading of the natural and artificial.” Their low-rise projects express inventive ways to weave structure and landscape together, like Seattle’s Olympia Sculpture Park (2007) or the Brooklyn Botanic Garden Center (2012). This approach reaches its apogee in the Novartis Visitor Center (2013). I can’t remember a high-security checkpoint being so graceful—like the spirit of one of Calatrava’s birds rather than the remains. They reminded us, with their handsome portfolio, that our experience of nature is largely constructed. An unexpected surprise was a last-minute replacement, the tall and very funny Jeff Goldstein from the Philadelphia based firm DIGSAU. Without a written script, he showed us a modest not-for-profit center that trains at-risk youth. Students helped build the wood collage wall. It was a glorious example of how to create authentic community engagement. Shohei Shigematsu, the head of the OMA’s New York office, showed us that there is a future to OMA beyond Rem Koolhaas. Milstein Hall, the expanded center at Cornell University’s College of Architecture, Art, and Planning reminded of some of the big moves architects employed in the 60s. OMA’s diagrams are ingenious, but the spaces are not inviting. One of Shigematsu’s most interesting projects is his collaboration with artist Taryn Simon at the Park Avenue Armory. The concrete columns have a stillness that some of the jazzier permanent buildings do not. My spectacular visuals award goes to Dominique Jakob of the Paris-based Jakob + MacFarlane. Their design appears to be rooted in digital technology and seemed far removed from the mundane requirements of our West Coast digital overlords. On the river in Lyon, two office buildings, the “Orange Cube” and the “Green Cube,” with bold color and grand cutouts, make Apple’s and Facebook’s new buildings look almost banal. The firm’s 100-unit social housing project in Paris doesn’t follow the form of typical Parisian apartment blocks, and Jakob’s use of ETFE film for balcony curtains gives the building a wrapped Christo look on each floor. What was called the “Tribal Elders” slot at previous conferences was filled with the Los Angeles graphic and exhibition designer Gere Kavanaugh. Noted architect and writer Pierluigi Serraino, a raconteur and interviewer of some skill, could not contain Ms. Kavanaugh. While her presentation of modernist graphics did go on too long, Gere was entertaining. Another determined Angeleno, Julie Eizenberg, talked about Urban Hallucinations, her new non-monograph. Her firm Koning Eizenberg has focused on Los Angeles. They are unafraid of the quirky, the cheap, the historic, the imaginary, the gritty, or the glamorous. This is an architect who thrives on constraints and, as she says, “stretches the limits.” One of my favorite new projects was the Pico Branch Library, which allows everybody to connect to the larger digital universe while staying grounded in the very nonimaginary neighborhood. The “Emerging Talents” included Laura Crescimano, a founder of SITELAB Urban Studio with the late Evan Rose. She charts the course for design professionals engaging disadvantaged communities. Heather Roberge of Murmur and Jimenez Lai and Joanna Grant of Bureau Spectacular reminded us that Los Angeles’s up-and-coming architects are just as bold as the earlier generation. Stanley Saitowitz/Natoma Architects alum Alan Tse stole the show. In the few minutes he was allotted, he made us laugh and admire his considerable talent. His restaurants and interiors are sublime, and his construction budgets are what other architects would charge in fees. He made architecture real in a way I’ve rarely seen. We all needed some levity and inspiration as we returned home to question how or even whether we should rebuild so close to the wildland/urban interface. 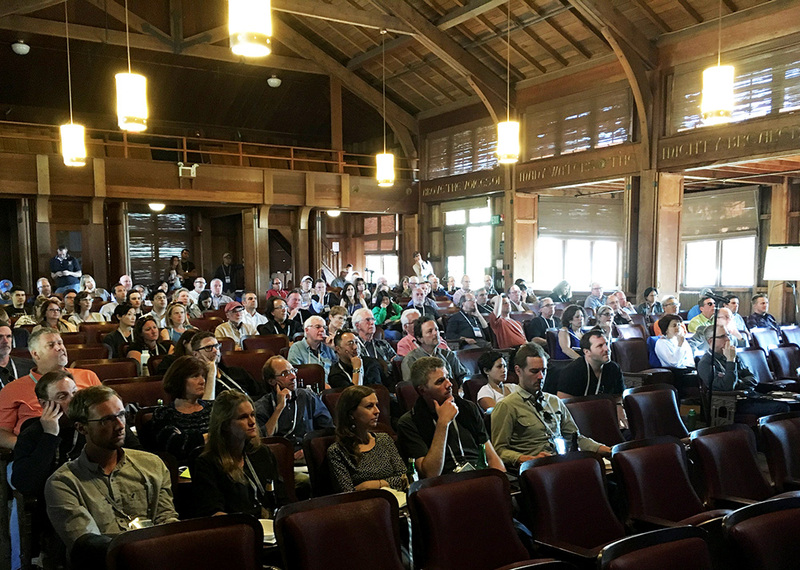 As with most Monterey Design Conferences, we came away with more questions and few answers. “House Vision 2” in Tokyo tackles a simple question: How can architecture connect people? fic survival strategies with the potential to show how we will live in the future," the statement continued. Talks are due to be held at the exhibition, which runs through to August 28 of this year, at the Rinkai Fukuroshin, J­area, 2­1 A omi, Koto, Tokyo. Visitors to the exhibition can find the Yoshino House, a product of Airbnb’s newly announced design studio, Samara, who worked with Tokyo-based architect Go Hasegawa. Earlier this year, AN's senior editor Matt Shaw sat down with with Co-founder and Chief Product Officer Joe Gebbia to discuss the house and the future of housing and community. Tickets for House Vision can be purchased here and as well as at the gate. 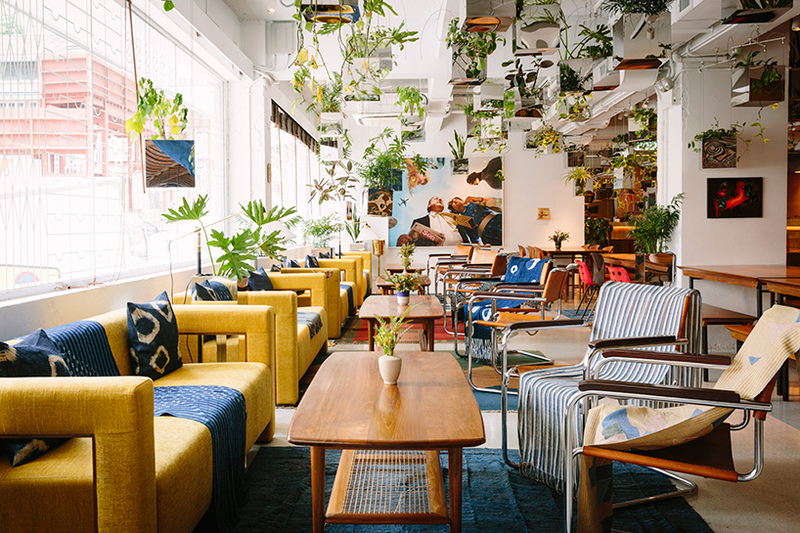 Japanese architect Sou Fujimoto has realized his design for the interior of Potato Head, an Indonesian food chain in Hong Kong, his first project in the country. Drawing on traditional and minimalist styles, the open space houses a restaurant, retail space, music room, and coffee shop. At the entrance, display units made from white metal fixings stand alongside plantings. The vegetation is suspended in stainless steel planters creating a "floating forest"—a nod to Potato Heads tropical roots. Other references to the food chain's Indonesian heritage can be found with 700 hand-painted panels from the Toraja people that cover the walls. Externally, the building's facade displays a geometric pattern reminiscent of traditional window framing found in the area. The display units showcase Fujimoto's customary structural style, similar to the architect's 2013 Serpentine Pavilion. The eatery is located to the rear of the building. In this area, traditional Indonesian furniture lies adjacent to mid-century furniture icons such as leather armchairs from Marcel Breuer. Fujimoto used teak for much of the seating area of the building, creating a visually warm environment. Diverging away color palette of the store, wood panels have been painted with ornate patterns, and dark blue velvet has been used for some seating attached to the wall. Behind the restaurant, a hidden-away music room is accessible only through three side entrances. This space aims to be a hub for vinyl-lovers and audiophiles. 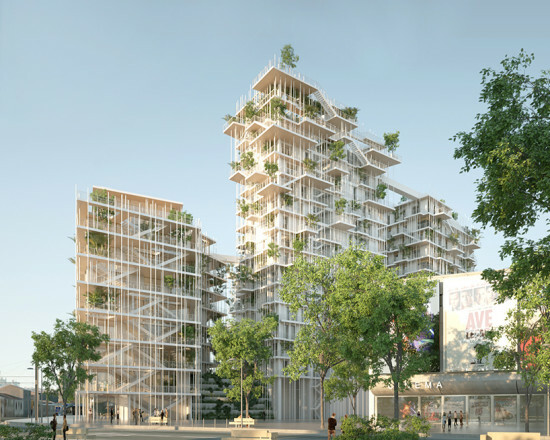 Japanese architect Sou Fujimoto in collaboration with French firm Laisné Roussel have released plans for an 183,000-square-foot vegetated tower complex in Bordeaux. Titled "Canopia," the project comes after the RéInventer Paris scheme that saw Fujimoto and others respond to the task of reimagining the French capital with more vegetated proposals. In what appears to be a growing trend, green towers are sprouting up in Milan and Singapore courtesy of Stefano Boeri and WOHA, respectively. This mixed-use scheme sees four wooden towers, all bursting with trees and other plant life, rising to 164 feet. The lower levels will house retail space and offices with apartments. Above will be apartments with private balconies. Bordeaux City officials had invited Sou Fujimoto and Laisné Roussel to submit a proposal as part of a much wider 8.5 million square foot masterplan known as Euratlantique. The masterplan centers on the south eastern part of Bourdeaux where the Saint-Jean railway station will receive a new high-speed rail connection to Paris. With the new connection, Bordeaux hopes to establish itself as a major European city. https://vimeo.com/158741801 Four vibrant roof gardens are located at the towers' peaks. Connectivity is a recurring theme within the project; staircases and other interior walkways are often prominently featured on the facade. Elongated timber needles connect the terraces. “Particular attention has been paid to delivering quality shared spaces, both on the fringes of the site with the terrace gardens, or at the heart of the development with the green oasis,” said the design team. In addition to acting as social spaces, the rooftops feature vegetable allotments, fruit trees, vines, a compost area, water reservoirs, winter garden, and a restaurant. In terms of structure, the building's timber frame comprises silver fir and spruce. Glu-lam wooden braces stabilize the building frame. As part of a master plan comprising 23 sites across Paris, Sou Fujimoto, David Chipperfield, and 20 others have been named as winners involved in responding the the Mayor's call to "reinvent Paris." https://twitter.com/Paris/status/694829444243046400?ref_src=twsrc%5Etfw "A city like Paris must be able to reinvent itself at every moment in order to meet the many challenges facing it. Particularly in terms of housing and everything relating to density, desegregation, energy and resilience," said Anne Hidalgo, Mayor of Paris. "It is important in today's world to find new collective ways of working that will give shape to the future metropolis." The scheme was launched last year at the start of November, and has prompted many architects and developers to submit plans for the 23 sites across the city. Ranging from empty brownfield sites, polluted wastelands, classified mansions, office renovations, and train stations, Hidalgo's plan has been hailed by many with French publication Talerma going so far as to call it a "stroke of genius." Despite the number of changes, one of the 23 sites, an 1880 neo-Gothic former Korean Embassy-turned-mansion has been left neglected. The judges deemed that no proposal (barely any were submitted) was worthy of construction and so the ageing structure will be left untouched on the Avenue De Villiers. The same cannot be said for the Messana railway station, however. Given the unusual location and former typology, many were inspired to make it their own and judges were spoilt for choice. The winning submission came from Lina Ghotmeh DGT Architects who transformed the space into a healthy eating haven. Including a rooftop vegetable garden, a laboratory for agroecosystem research, gardening classrooms, residences for young chefs, bar, and, of course, restaurant. Other notable winning submissions came from British architect David Chipperfield and Sou Fujimoto from Japan. Working alongside Danish-Icelandic artist Olafur Eliasson, Chipperfield will "reinvent" the Immeuble Morland, a 164-foot tall once state-owned building that lies on the river Seine. The mixed-use program will include a swimming pool, ground floor food market, gym, a hotel, offices, a creche, youth hostel, and set aside 53,800 square feet for social housing. The top floor will also offer panoramic bar and restaurant. Fujimoto, meanwhile, collaborated with revered French product designer Philippe Starck and Manal Rachdi of OXO Architectes. Fujimoto's project will stretch across the Boulevard Périphérique, by the Palais des Congrès de Paris and offer what appears to be a densely packed green roof. Like Chipperfield, Fujimoto dedicated a large portion of his project to social housing. In fact, this will assume 30 percent of the development that will also offer office space, a community center, kindergarten, and play area. The projects are set to cost over $1.46 billion and return $634 million in revenue to the city through the sale or long-term leasing of land. In addition to this, 2,000 over the course of three years are expected to be generated via construction alone. Just like every other major architectural exhibition, the Chicago Architecture Biennial is a massive undertaking filled with large scale models, full size mock- ups and room sized installations. However, the most light-handed approach in the main exhibition can be found sandwiched between two full scale houses. 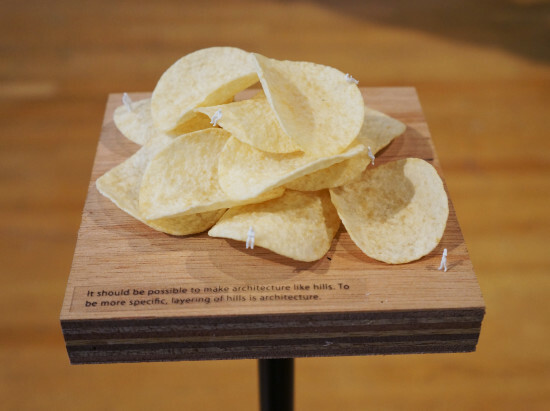 Japanese architect Sou Fujimoto placed about 40 different found objects on five-inch-by-five-inch plywood bases. The objects range from wooden branches to industrial mass-products like ashtrays, to processed food such as chips or candy. Each plate is populated with white scalies and paired with a line of text. A sponge becomes a “myriad of voids layered on top of another, creating a density of void” and a pine cone reads: “When one thinks about it, this form has been a friend in architecture for thousands of years.” The casual inexpensiveness of the objects is amplified by the way they are displayed, seemingly without attachment. A pile of loosely arranged chips seems likely to fly away with the next visitor brushing by. Clearly there is a relationship to Fujimoto’s search for lightness, literally in the appearance of the architecture but also in the figure of the architect being open to inspiration from unexpected sources. This minimal installation eclipses many of the larger efforts of the show—Aaron Betsky called it the most successful installation in the main building. While the installation brings up questions about the role of ready-mades in the design process and issues of scalability, it also quietly mocks the expensive, time- and energy-consuming efforts of some of the exhibitors. With ease it brings playfulness and the joy of simple discoveries back into the discussion. AN got a firsthand look at some of the projects inside the Chicago Cultural Center, many of which are juxtaposed across media, scale, and intellectual territory. For example, simple wood models from South African studio Noero Architects' 180 Square Meters sat quietly next to a wild set of renderings by François Roche that showed digital narratives of buildings as characters in their surroundings. Nearby, an oddly-detailed full-scale mock-up of a light steel stud-framed room welcomed visitors to go inside. Here are some of our favorites from our first glimpse at the sprawling main exhibition in Chicago: "The End of Sitting" questions why we design so much of our environment for sitting, given recent research showing how unhealthy it is to sit all day. This is the first show by the radical architecture and media collective Environmental Communications. It includes a selection from 200,000 images found in a Venice, California, garage. The Rock Print load-bearing column was built using a robot that placed rocks bound by string into a mold, which was then removed to create this curious structure. Atelier Bow-Wow occupied the courtyard of the Cultural Center, which is an important place, but is often cut-off from the rest of the building. They animated the courtyard by exploring the idea of a prison as a place of potential. Amanda Williams's work on the south side of Chicago includes a set of abandoned houses painted with colors derived from pop culture in the surrounding neighborhoods. It is displayed in a hallway. MOS Architects built a house made of hallways to critique McMansions, which they see as all foyers and hallways. Its disciplinary deadpan was a great juxtaposition next to "Architecture is Everywhere" by Sou Fujimoto Architects, a series of small everyday objects, like staples and binder clips, arranged into architectural models complete with scale figures. 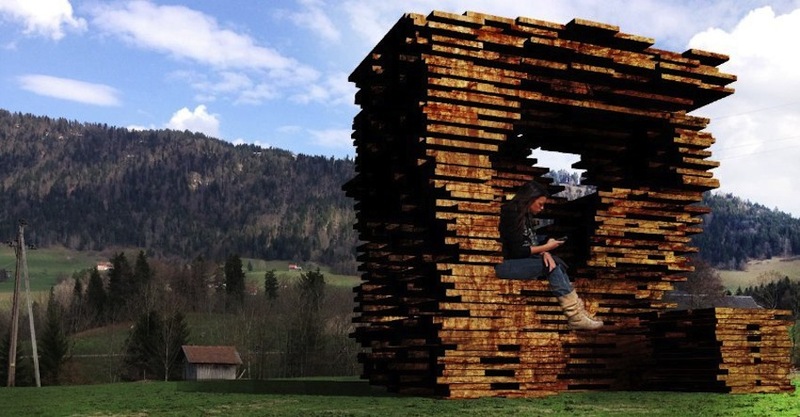 Makeshift is an ad-hoc construction that responds to its specific site with an improvised structure for music performance. It is based on the music legacy of Chicago. The Biennial is bustling with people as well, as everyone from Chicago Mayor Rahm Emanuel to designers from around the world are in attendance. 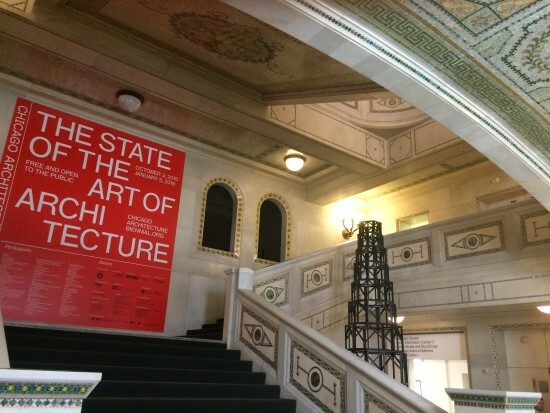 For ongoing Chicago Biennial coverage, check back with AN over the next few days and weeks. The Marcus Prize is awarded bi-annually to an emerging architect in the early stages of his or her career. Hosted by the the University of Wisconsin, Milwaukee School of Architecture & Urban Planning and supported by the Milwaukee-based Marcus Foundation, it has a record of supporting talented young practices before they become well know including: Winy Maas (2005), Frank Barkow (2007), Alejandro Aravena (2010), and Diebedo Francis Kere (2011). The studios have traditionally built small public pavilions in Milwaukee in the spring semester of the award. 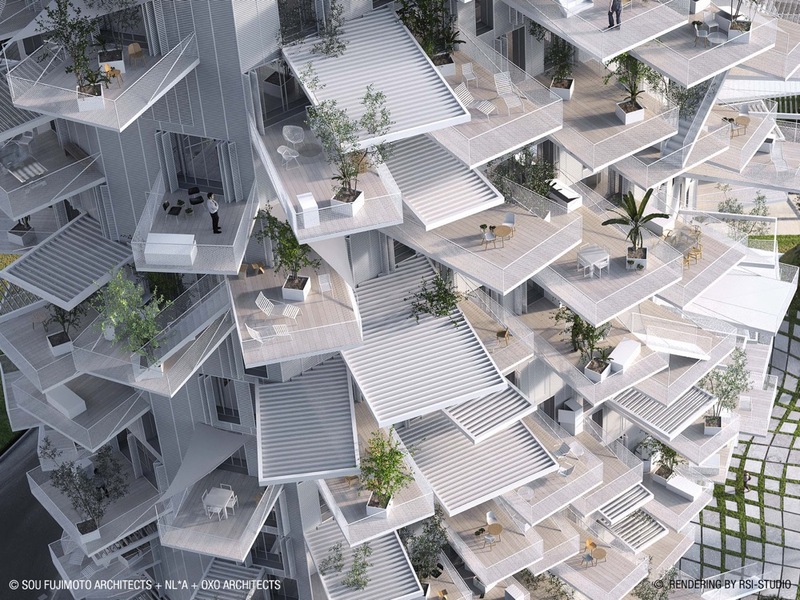 The 2013 winner was Sou Fujimoto from Japan. (Full disclosure: I was on the 2013 jury.) Like the other winners, his studio built a temporary pavilion, faBrick Pavilion, in an undeveloped lot this past summer. Built with UMW professor Mo Zell and university students, this brick installation pays homage to the city's long tradition of masonry construction. It also attempts to transform the typically heavy and cumbersome material into something more malleable, playful, and lighter on the ground. FaBrick creates flowing arches in a way that "form a rippling brick carpet that invites human interaction and exploration" and appears almost supple as a material. Finally, the brick (with connecting wood struts) wants to challenge how we sit, stand, lean and move. With the grass growing up through the lattice of bricks, the pavilion allows nature in the lot to re-assert itself. The Marcus Prize is only in its 10th bi-annual year, but has been such a success in what it has produced and who it has helped that it should be as well known as its Chicago neighbor, the Pritzker Prize. The award is for $100,000 with $50,000 of this going to the winner and an additional $50,000 put forward for the winner to lead a design studio in collaboration with UWM faculty. The Serpentine Pavilion 2014 continues a history of small romantic constructions seen in parks or large gardens, the so-called follies that were popular from the late sixteenth century to the beginning of the nineteenth century. In general, follies appear as ruins or have been worn away by time, displaying an extravagant, surprising and often archaic form. These characteristics artificially dissolve the temporal and physical limits of the constructions into their natural surroundings. The 2014 Pavilion takes these principles and applies them using a contemporary architectural language. 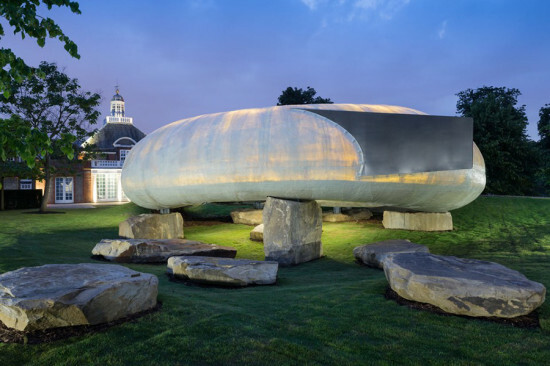 The unusual shape and sensual qualities of the Pavilion have a strong physical impact on the visitor, especially juxtaposed with the classical architecture of the Serpentine Gallery. From the outside, visitors see a fragile shell in the shape of a hoop suspended on large quarry stones. Appearing as if they had always been part of the landscape, these stones are used as supports, giving the pavilion both a physical weight and an outer structure characterised by lightness and fragility. The shell, which is white, translucent and made of fibreglass, contains an interior that is organised around an empty patio at ground level, creating the sensation that the entire volume is floating. The simultaneously enclosed and open volumes of the structure explore the relationship between the surrounding Kensington Gardens and the interior of the Pavilion. The floor is grey wooden decking, as if the interior were a terrace rather than a protected interior space. At night, the semi-transparency of the shell, together with a soft amber-tinted light, draws the attention of passers-by like lamps attracting moths. It's easy to get overwhelmed at the Salone del Mobile and the dozens of related events during Milan Design Week. Luckily there are plenty of visual palate cleansers in form of immersive environments, from new showrooms by Pritzker Prize–winning architects to dazzling installations by up-and-coming designers. There is more to Milan Design Week than just great looking furniture! 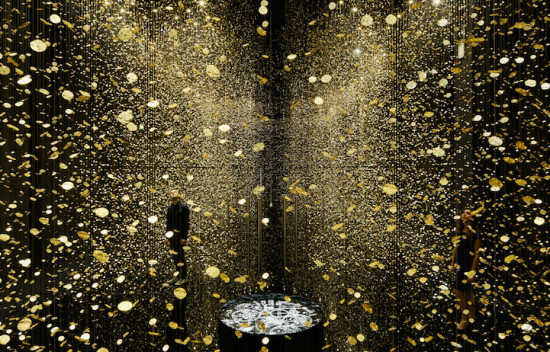 At the Triennale design museum, for instance, Paris-based DGT architects created a light-catching installation for Citizen watches called Light is Time (above), featuring space dividing curtains made of tens of thousands of watch plates. For the Swedish textile company Kinnasand, a division of Kvadrat, Toyo Ito designed a luminous new showroom to display the company's fabrics, many of which feature diaphanous qualities. Ito covered the walls in frosted glass, which gives them a shimmering quality as downlights tucked into the edge of the ceiling filter through the panels. The ceiling itself is paneled in reflective metal. Draped fabrics are displayed on curved metal rods suspended from the ceiling. Cassina tapped the rising Japanese star Sou Fujimoto to design a "floating forest" for their booth at the fairgrounds, arguably the most innovative display at the Salone. Fujimoto hung mirrored metal planters from the rafters, which held green Japanese maples. Canned bird noises added to the atmosphere, which felt both natural and surreal within the tradeshow hall. The reflective surfaces forced visitors to slow down within the booth, giving them more time to look at Cassina's classic and contemporary furnishings. 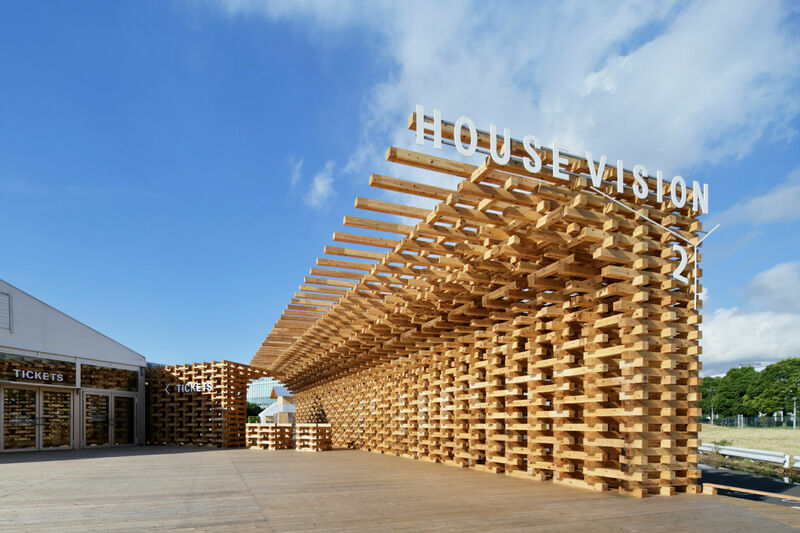 Also at the fairgrounds, an invited group of architects—Shigeru Ban, Mario Bellini, David Chipperfield, Massimiliano and Doriana Fuksas, Zaha Hadid, Marcio Kogan, Daniel Libeskind, and Studio Mumbai—riffed on themes of domesticity with conceptual installations called, Where Architects Live. As far as installations like these at a furniture fair go, the installations were largely devoid of the trappings of daily life. Libeskind, for example, sliced deep voids into the walls, inset with screens showing videos about his personal history and architectural projects. Chipperfield showed of his German side, with photos of deliciously drab Berlin and clanging music underscoring the seriousness of the project. A slew of internationally-renowned architects have convened on the unlikeliest of sites. 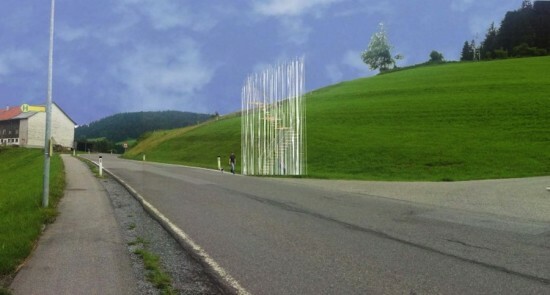 Krumbach, Austria, a town of less than 3,000 may soon be the location of bus stops designed by Sou Fujimoto and Pritzer Prize Winner Wang Shu among others. The BUS:STOP initiative is the brainchild of kulturkrumbach which managed to entice the heralded names to participate in a bus stop design project with the promise of a free vacation and little else. Along with Fujimoto and Amateur Architecture Studio (Wang Shu's architectural practice), Alexander Brodsky, Rintala Eggertsson Architects, Architecten de Vylder Vinck Taillieu, Ensamble Studio, and Smiljan Radic all made the journey to the eastern Austria meaning that 7 countries and 3 continents are represented in the project. Upon visiting the town each architect designed a prospective bus stop and then presented their models in a separate ceremony. While each was envisioned in miniature, a full scale replica of Chilean architect Radic's structure was manufactured and displayed at the exhibition. Each international designer will be accompanied by a local architect to aid in the realization of each project and foster cultural exchange. By and large the proposals depart from the traditional bus stop form. While the designs seem to vary in plausibility, Fujimoto's offering, featuring a spiral stairway to nowhere and entirely lacking a roof, seems particularly problematic. In spite of its small size, Krumbach is no stranger to contemporary architecture. If they are to be implemented, the BUS:STOP creations will join a series of recently constructed noteworthy structures found in the area, including a sleek Bushaltestelle contributed by Austrian studio Hermann Kaufmann in 2011.